History: In 1943, the Chase Aircraft Company was created to design and build a heavy assault cargo glider for the US Army. Several early prototypes eventually led to the production of the XG-20 glider in 1949. The new US Air Force expressed an interest in a powered version of the aircraft, so the company installed two 2,200-hp Pratt & Whitney Double Wasp engines and named it the XC-123 Aviatruc. It was first flown on 14 October 1949. In 1953, a production order for 300 C-123B Providers was received by the Kaiser-Frazer Company, which had since acquired a majority holding in the Chase Company. When Kaiser-Frazer had production difficulties, Fairchild stepped in and took over the C-123 program. The first production aircraft reached the Air Force in late 1954, and immediately became popular with tactical transport aircrews for its ruggedness and reliability. A small number were delivered to Saudi Arabia, Venezuela, the Philippines, Taiwan and South Vietnam. In the early 1960s, a couple of Fairchild J-44 turbojet engines were fitted in pods under the wing, giving the aircraft a big boost in performance and resulting in the C-123J. Later, the C-123K variant appeared, which featured two 2,800-lb thrust J85 turbojets in similar pods. Most US Air Force C-123s served in the Vietnam War, where they served as troop and cargo haulers. Some were utilized as defoliant (Agent Orange) sprayers (UC-123Ks) in Operation Ranch Hand, and at least two were modified as armament-carrying AC-123K / NC-123Ks, which operated at night against enemy truck convoys. 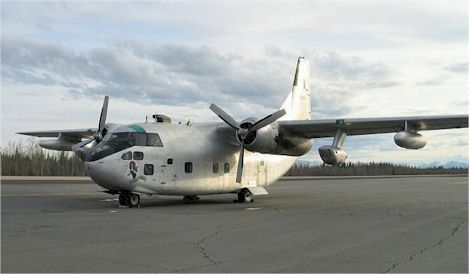 The C-123 soldiered on into the 1980s, serving with several Air National Guard units, some being fitted with wheel/ski landing gear for use in Arctic conditions. Today, surplus C-123s are popular with small freight companies throughout the Americas, and a few are even found on the warbird circuit. Several are repeatedly used in television advertising and movies when the need arises for the representation of a large, generic military cargo aircraft. Engines: Two 2,300-hp Pratt & Whitney R-2800-99W Double Wasp 18-cyinder radial piston engines, and two 2,850-lb thrust General Electric J85-GE-17 auxiliary turbojets. Weight: Empty 35,335 lbs., Max Takeoff 60,000 lbs.